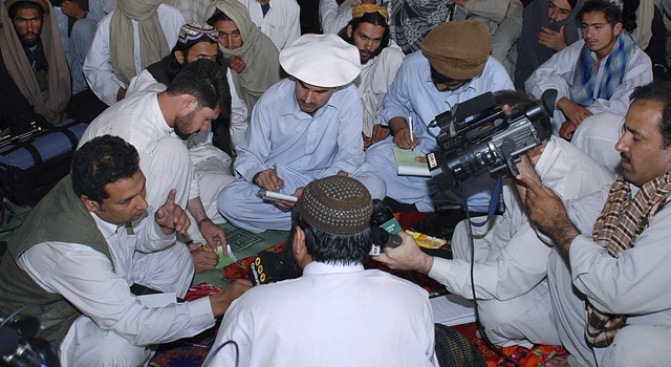 Pakistan's top Taliban leader Baitullah Mehsud, center bottom with back to camera, talks to the media in a Pakistani village last year. DERA ISMAIL KHAN, Pakistan — The commander of the Pakistani Taliban claimed responsibility Tuesday for a deadly assault on a Pakistani police academy and said the group was planning a terrorist attack on Washington that would "amaze" the world. The U.S. Embassy in Islamabad declined to comment on the threat. Mehsud and other Pakistani Taliban militants are believed to be based in the country's lawless areas near the border with Afghanistan, where they have stepped up their attacks throughout Pakistan and against U.S. and NATO forces over the border. The Taliban leader also claimed responsibility for a suicide car bombing that killed four soldiers Monday in Bannu district and a suicide attack targeting a police station in Islamabad last week that killed one officer. Such attacks pose a major test for the weak, year-old civilian administration of Pakistani President Asif Ali Zardari that has been gripped with political turmoil in recent weeks. Interior Ministry spokesman Raashid Bashir Mazari said Tuesday an investigation was under way into the attack on the police academy in Lahore but it was too early to respond to Mehsud's claim. However, Interior Ministry chief Rehman Malik said Monday that authorities had information linking the attack to Mehsud. He said at least one of the attackers arrived in Lahore about 15 days ago from Mehsud's stronghold of South Waziristan near the border with Pakistan and rented a house. The gunmen who attacked the police academy killed seven police and two civilians, holding security forces at bay for about eight hours before being overpowered by Pakistani commandos. Some of the attackers wore police uniforms, and they took hostages and tossed grenades during the assault. Earlier Tuesday, a spokesman from a little-known militant group linked to the Pakistani Taliban also claimed credit for the attack and a similar ambush-style attack against the Sri Lankan cricket team earlier this month in Lahore. It was not immediately possible to reconcile the two claims. Omar Farooq, who said he is the spokesman for Fedayeen al-Islam, said the group would carry out more attacks unless Pakistani troops withdraw from tribal areas near the Afghan border and the U.S. stops its drone strikes. The group previously said it was behind the deadly September bombing of the Marriott hotel in Islamabad that killed 54 people. Mehsud declined to comment on Fedayeen al-Islam's claim that it carried out the attack or to say whether the group is linked to his own. "At this time, I will not give any detail," Mehsud said. The Pakistani Taliban leader also said he was not deterred by the U.S. bounty on his head. "I wish to die and embrace martyrdom," he said. The AP has spoken to Mehsud several times in the past and recognized his voice, and a request for an interview with Mehsud was submitted through his aide. The militant leader also granted phone interviews to other media organizations. The Pakistani Taliban has links with al-Qaida and Afghan Taliban militants who have launched attacks against U.S. and NATO forces in Afghanistan from a base in the border region between the two countries.